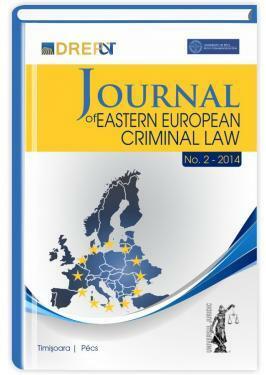 Journal of Eastern-European Criminal Law could stand out as a unique publication, at least in this part of the world, as an outcome of the partnership between specialists in criminal law and criminal procedure law from the law faculties of the West University in Timisoara and the University in Pecs, who aimed at presenting, in a different language from their own, the serious amendments of criminal legislation that occurred in their countries in the post-communist era, an essential requirement for the rule of law. We envisage this journal, published semesterly, to be open to all researchers in the academic environment from the former communist countries, to professors, PhD students, but also, to magistrates and other professionals interested in the evolution of criminal legislation and in the more and more firm response to be given to the criminal phenomenon, while observing the fundamental HUMAN rights. Crime is no longer a purely national issue, it is no longer a feature of one country, and the Penal Codes conceived by following the pattern of sovereign jurisdiction of national states are not, by themselves, the only available instruments for an effective opposition to the new forms of crime. The creation of a common area of freedom, security and justice, based on the principles of transparence and democratic control needs an open dialogue between doctrinaires and practitioners of law in general, and those of criminal law and criminal procedure, first and foremost. Knowledge of the inherent features of national legislations can facilitate the mutual recognition of court decisions, as well as the police and judicial cooperation in criminal matters at cross-border level. Globalization of law is able to lead to a stability of relationships between humans, including of those between the magistrates belonging to different national judicial systems, the professional exchanges thus amounting to the establishment of a broad judicial network, at global level, animated by common spirit, culture and even projects. In this context, the comparative study of certain legal institutions, the quotation of some decisions passed by the courts of law abroad offers to judges a source of ideas in their quest for logical reasoning or solutions. Globalization is an argument in favor of “another way of learning law” in which the references to comparative law become a must which, if not confronted by universities, “there will emerge a real risk of provincialization of the law faculties within their own country”. That is why the current edition of the journal is mainly an invitation to join our team for all those interested in the evolution of criminal law and criminal procedure law and criminal sciences, in general.